During Fashion Week, I had the privilege of attending an awesome social justice fashion event focusing on cultural appropriation in the fashion industry. Instead of the usual fashion week after party, Becca McCharen-Tran, the creative genius behind Chromat (a swim and athletic apparel line pushing the boundaries of design and inclusion) curated a post-fashion show panel discussion on social justice issues in the fashion industry. 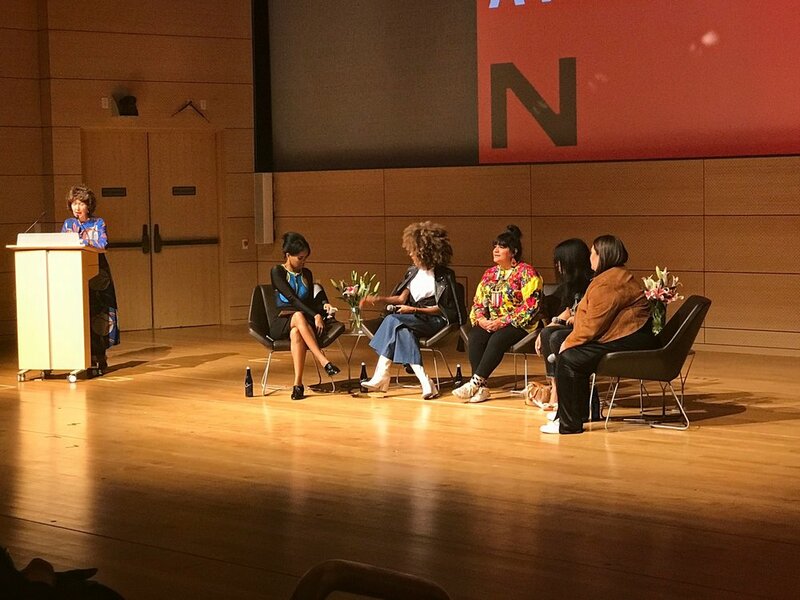 The panel entitled “Fashion, Culture, and Justice: A NYFW Dialogue” was held at the New School and featured some behind-the-scenes professionals responsible for progressive social changes in the fashion and beauty industry. The discussion, moderated by professor Kim Jenkins, lecturer at Parsons School of Design, lasted around two hours. The panel consisted of: Elaine Welteroth, Editor- in- Chief of Teen Vogue, Amy Farid, Celebrity Hair Stylist of Native American descent, Aurora James, Creative Director of Brother Vellies and Anastasia Garcia, famous Photographer. Each member of the panel brought with them their ethnicity, experiences and perspectives on social justice as it relates to fashion. Elaine Welteroth discussed the controversy of being the first black Editor-in-Chief of a Conde Nast publication and how her influence helped to spark conversations around appropriation and inclusion in fashion. Amy Farid, an outspoken bubbly hair stylist of Native American descent, spoke about her journey into her profession and the importance of representation. She advocated for less marginalized people to do more research and learn empathize with various cultures rather than imitate. Aurora James discussed how her brand empowers artisan shoemakers in communities in Ghana. Her luxury brand of shoes, Brother Vellies, are made in Ghana and support the jobs and livelihoods of many people. She shared a time when Steve Madden attempted to knock off her products. During this incident, social media influence helped get the items taken down from the site despite threats from the brand. Anastasia Garcia, of Puerto Rican descent, spoke about her photography of women of all colors, shapes and sizes and the importance of representation in mainstream media. She was quoted as saying “Every time you spend money, you are voting with your money…” advising the crowd to be conscious of how money is spent and who we are empowering. The panel covered additional topics on appropriation, representation and the importance of inclusion in the fashion industry. It was amazing to see so many women of color proudly discuss their journey, background and contributions to the industry as it related to social justice issues. Attending the panel discussion shed light on the issue of fit in a new perspective; fit is not just a technical issue or an online conversion issue, fit is a social justice issue.Fit has much more to do with a lack of representation of sizes and shapes in fashion both in-store and online. The lack of better fitting clothing and a clear perception of fit online actually marginalizes groups of shoppers who should be apart of the fashion experience. “Everybody Deserves the Right Fit” is a slogan campaign I developed after attending the panel discussion. The idea is to bring about awareness for the need for better fit experiences so that people with all shapes, sizes and hardships can experience their best look and participate in the fashion experience. The campaign features women from diverse backgrounds and can view view on instgram @luxorandfinch. So much of fashion and style is about confidence and personality, an inability to perceive fit isolates groups of people who are not able to participate in online shopping or who cannot easily physically try-on clothing. The idea that clothing is just for one body type is just not true. In a time where we celebrate our differences, there should be more emphasis on fit, sizing, shape and clothing for all body types. As someone who is not the average size, I know how difficult it is to find garments that make you look as great as you feel. The entire try-on experience can be discouraging. Without better sizing standards, brands miss out on having loyal customers. Without better fit experiences, online brand miss out of reaching their targeted customers and without better technology everyone cannot shop confidently. It is silly to think that designers are only designing for one body type when the world exist in so many beautiful shapes and sizes, all of which should be celebrated.Fit technology and innovative fit practices exist to solve that exact problem. Whether it is helping designers create better fitting garments by understanding body shapes, patterns, measurements and grading better. Simply helping to connect consumers to the products best for them matters the most. Fit is much more than just reducing returns it’s about connecting to your customers and providing ways to include them into the fashion experience to make them feel confident, beautiful and a part of a community.